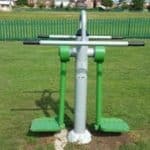 Woodhouse Gardens, Allotments, Grit bins, Churchyard, The Skate Park, Cemetery, Grants, Sports Pitches, Outdoor fitness equipment, Markets, Play Areas, and CCTV while promoting and representing the town with other national and statutory bodies. For example, the Town Council acts as a consultee and lobbying force with the Dorset Council and regional and national government putting forward the wishes and needs of the local community. The Dorset Council (formed in April 2019) covers the whole of the county except Bournemouth and Poole. It’s main responsibilities include education, social services, highways, strategic planning, libraries, development control, environmental health, refuse collection, economic development, tourism and major recreational facilities such as the Blandford Leisure Centre. The Dorset Council consults with the Town Council on such subjects as the County Structure Plan, the Local Transport Plan, the Mineral and Waste Local Plan, the Local Plan, planning applications within Blandford Forum and the economic development strategy. 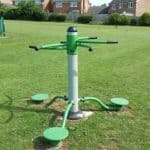 The Town Council owns and maintains three play areas out of the seven play areas in Blandford Forum. 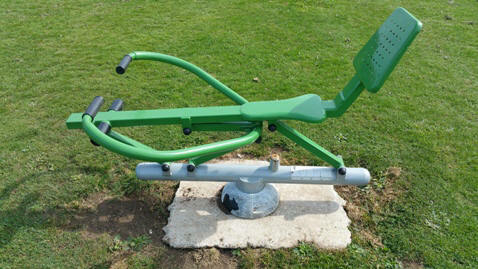 The equipment in our play areas is aimed to teach and challenge young children. 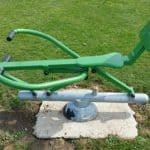 Listed below are the three Town Council owned play areas. Langton Road Play Area was refurbished in March 2013 and due to the size of the site has equipment suitable for children up to 12 years old. 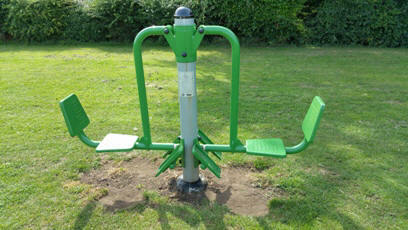 There is also equipment suitable for disabled children. Park Road Play Area was refurbished in March 2013, and was partly funded by the Big Lottery Fund through Awards for All. 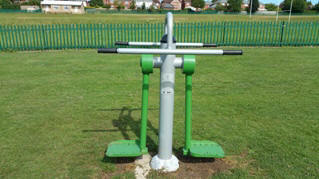 The site has equipment that is suitable for children up to 6 years old. 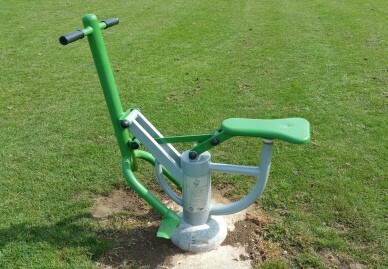 There is also equipment suitable for disabled children. 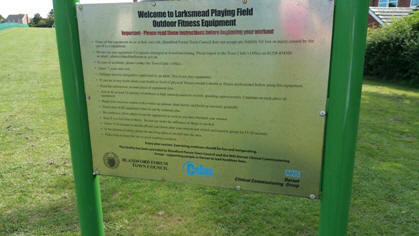 Larksmead Play Area was refurbished in 2008 and is suitable for children aged up to 6 years old. 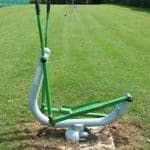 The Town Council’s Recreation & Amenities Committee has recently agreed to install a swing for disabled users at Larksmead play area and was installed in February 2013. 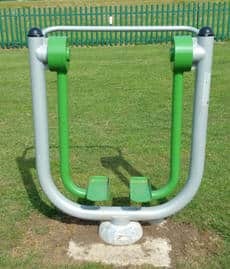 The Town Council has received the transfer of Phase 2 of Badbury Heights, which includes a play area known as a Local Equipped Area of Play (LEAP) on Balmer Road. This play area has now been installed at the beginning of June 2018. 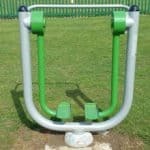 There are four other play areas in Blandford Forum. The Milldown Play Area, owned and maintained by the Dorset Council and Hunt Road Play Area, owned and maintained by Signpost Housing Association, two play areas in Westbury Way owned and maintained by Persimmon Homes, and one play area in Diamond Way owned and maintained by a private management company. Owned and maintained by the Town Council the Skate Park is situated behind Tesco’s next to the free Stour Meadows car park. 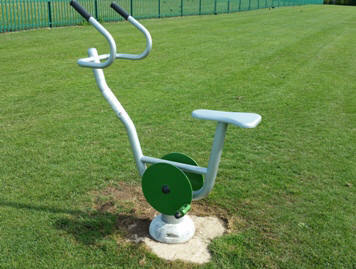 There is a cycle rack available on site. Its equipment includes a Half Pipe, Jump Boxes, a Pyramid, a Fun Box and a Driveway. 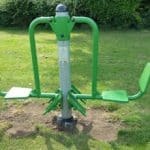 New exercise equipment that is free to use for people living in and around Blandford Forum is provided at Larksmead Playing Field. The equipment has been funded by Blandford Forum Town Council and NHS Dorset Clinical Commissioning Group North Dorset locality. 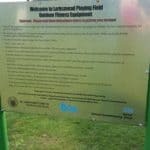 Instructions on how to use the equipment is displayed on a notice board at the site and on each piece of equipment. 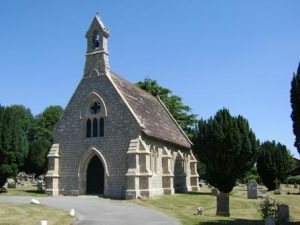 Blandford Forum Cemetery Records, Maps, Grave Locations and Memorial Photos Are Now Available To View Online at Deceased Online. Blandford Forum Town Council has a responsibility for public safety at Blandford Cemetery. As unsafe memorials have been the cause of severe injury in some cemeteries the Town Council’s grounds staff have undergone memorial condition training with the Institute of Cemetery and Crematorium Management. Our trained members of staff carries out an annual inspection programme checking the condition of memorials, which may result in unsafe memorials being either laid flat or staked to prevent damage or injury and the grave owners will be notified by way of a notice being placed on the effected grave. 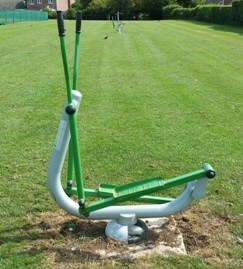 The registered owner of the memorial is requested to arrange for repairs to be carried out within twelve months. 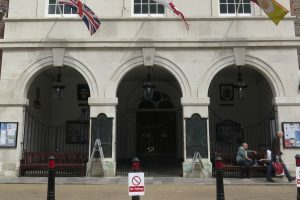 If the memorial is not repaired within this time, Blandford Forum Town Council will consider taking appropriate action. The Town Council therefore asks that memorials are not leant on or used for support and that visitors keep to the footpaths as much as possible in order to avoid shortcuts between memorials. The Town Council staff working at the cemetery understands the importance and significance of the graves and memorials to remaining friends and family. Please be assured that all memorials will be treated with the utmost care and respect. The Town Council have installed a number of grit bins throughout the town. Please see the link below for locations of grit bins in Blandford Forum. Dorset County Council has announced that if a grit bin is Strategic then they will be refilled free of charge, however if a grit bin is a Community grit bin the Town Council will be charged £45 to have it filled. Please see the interactive map for more information. Click on the snowflakes to find out whether the grit bin is a community one or a strategic one. 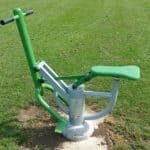 The Town Council has now taken on the maintenance of several amenity areas in Blandford Forum from the former North Dorset District Council (subject to contract). 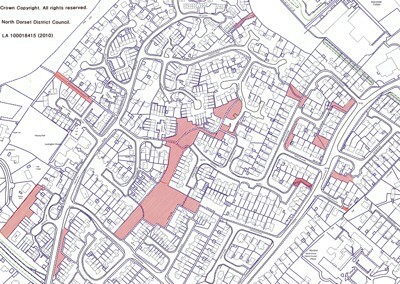 The areas are on the Damory Down Estate (within the vicinity of Jubilee Way and Holland Way) and are shown shaded/striped in the map below. Highway verges are still being maintained by the Dorset Council. 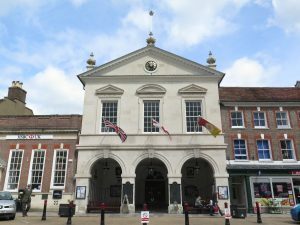 Blandford Forum Town Council owns, maintains and leases a number of locations in Blandford Forum. Grass cutting is carried out fortnightly throughout April to October, and adjusted where necessary. Currently the Town Council carries out grass cutting at the locations listed below. The Town Council has been working with the Police since 2004 in providing CCTV coverage in the most needed locations. Since then the Town Council has installed CCTV cameras which have proved to be valuable to the police on various occasions. These cameras are viewed by the Town Council staff on an ‘as and when’ basis. For example, they will be viewed if there has been an incident and this data will then be shared with the Police. In March 2019 a fifth ANPR camera was installed in Shaftesbury Lane. The Town Council owns the systems, however they are managed by Blandford Police (CCTV) and Dorset Police (ANPR). Blandford Forum has two allotment sites. 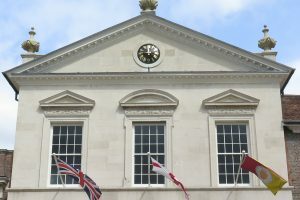 The Town Clerk, Responsible Finance Officer and Finance & Staffing Committee at Blandford Forum Town Council, Town Clerk’s Office, Church Lane, Blandford Forum, DT11 7AD, who can be contacted on 01258 454500, will be in control of the data you provide. The information which you provide in this application form and any other information obtained or provided during the course of the application is a contractual requirement to assess your grant application and failure to provide all of the information requested will impact on the likelihood of your organisation being offered a grant. Your information will be used solely for the purpose of assessing the application. A redacted version of grant application will be published in the public domain as part of the Finance & Staffing Committee agenda. 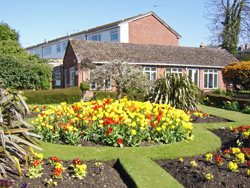 If your application is successful or unsuccessful, the information will be retained as part of Town Council administrative and financial records, until there is no longer an administrative requirement, after which time it will be archived at the Dorset History Centre or destroyed after review. You have the right to data portability, request access to, rectification or erasure of your data collected as part of this process. If your application is successful, the information will form part of our grants payments process and we will be entitled to process it as part of the successful grants process. You have the right to lodge a complaint with the Information Commissioner. The Town Council has a limited number of staff to carry out its range of functions. However, the Grounds and Maintenance team may be able to assist your organisation or Parish Council with grass cutting should you wish to enter into an agreement with the Town Council to do so. 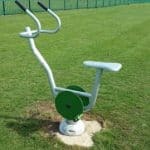 For example, the Grounds team cuts the grass at the Blandford Scout Hut and it also carries out health and safety checks on behalf of Blandford St Mary Parish Council on the outdoor equipment at Stour Meadows. The Dorset Council pay the Town Council to cut the grass verges around the Langton Long car park, long stay. In addition, the Dorset Council contracts the Town Council’s Grounds team to weed kill its car parks in the town and to cut the Marsh & Ham area. * Please note that the waiver of these charges is at the discretion of the Town Clerk. 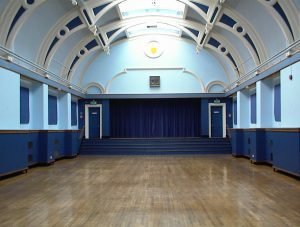 There are several venues for hire which may be suitable for a range of meetings and activities. To view any of the Town Council’s venues or to make a booking please contact the Bookings Receptionist at the Town Council on 01258 454500 during office hours Monday to Friday, 9.30am to 12.30pm. It has a large stage making it suitable for public performances with rear dressing rooms and toilet facilities. The main hall is large enough to hold “table-top” sales, markets, private functions and receptions. The floor is ideal for dancing. A kitchen is available for use and is equipped with refrigerator, urn, cooker and cups and saucers for 200. Pay and Display car parking is available within easy walking distance. There is disabled access at the main entrance where there are also toilet facilities including disabled. Wifi availability. An additional charge of £24.20 per hour or part thereof for bookings before 8 am and after 10.00 pm (applicable to all Town Council venues). From 1st April 2018. An additional charge of £24.93 per hour or part thereof for bookings before 8 am and after 10.00 pm (applicable to all Town Council venues). From 1st April 2019. An additional charge of £24.20 per hour or part thereof for bookings before 8 am and after 10.00 pm (applicable to all Town Council venues). An additional charge of £24.93 per hour or part thereof for bookings before 8 am and after 10.00 pm (applicable to all Town Council venues). Situated on the first floor (no disabled access) at the front of the Corn Exchange. The Town Hall is suitable for group meetings and courses and can accommodate 50 people maximum. Pay and display car parking is available within easy walking distance. Wifi availability. 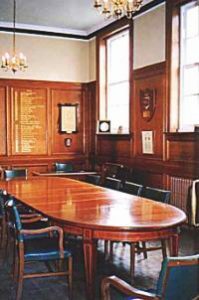 Next to the Town Hall the Council Chamber (no disabled access) offers a traditional setting for formal meetings or smaller groups and can accommodate up to 15 seated around the large meeting table. Wifi availability. Situated within Woodhouse Public Gardens next to the main Post Office in the centre of the town, Woodhouse Gardens Pavilion has recently been refurbished and provides an ideal setting for local organisations’ meetings. Popular for Art and other educational courses and suitable for small private functions and receptions, the Pavilion can be divided by a central partition and there are French doors, which open onto the main footpath of the gardens. There is a cloakroom with toilet facilities and a kitchen equipped with refrigerator, cooker and basic crockery. Set on one level a ramp is provided for disabled access, the Pavilion will accommodate 60 close seated. There is Pay and Display parking within easy walking distance. Wifi availability. Eagle House Gardens, Blandford Forum, DT11 7BT. Albert Street, Blandford Forum. For further info contact: Administrator on 01258 450689 or 01258 459756. Pimperne, Dorset. For further info contact: Robina Pierrepont on 01258 459034 (Evenings). Black Lane, Blandford Forum, DT11 8SW. Should you wish to display a notice, the Town Council also has two community notice boards on the Tabernacle public convenience building, next to the Post Office and Woodhouse Gardens. Please print your poster and bring it into the office so we can arrange to display it for you. The Dorset Council is the local authority responsible for collecting Council Tax. If you have any enquiries about your Council Tax please email customerservices@north-dorset.gov.uk or phone 01258 454111. The council tax charge for North Dorset residents is made up of charges for the Dorset Council, Dorset Police Authority, Dorset Fire Authority and the parish or town council. Blandford Forum is twinned with Mortain, Normandy, France. The Blandford & Mortain Twinning Association promotes the interests of individuals, groups, clubs and associations between the two towns of Blandford Forum, Dorset and Mortain, Normandy. New members are always welcome – please contact the Secretary for details. 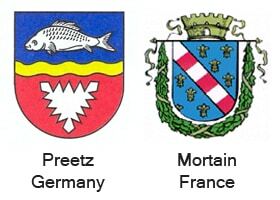 Blandford Forum is also twinned with Preetz, North Germany. Blandford & Preetz Twinning Association is an Anglo/German exchange group for student and adult exchange visits between the two towns of Blandford Forum and Preetz in North Germany. The student exchange has been running for almost 50 years and the adult exchange has just celebrated its 30th anniversary. During the year we hold various social events for all members and friends, in the form of Dining in Nights, Beetle Drives and a Summer Social.